I always cringe inside when I have to give out the same answer this time of year. “Sorry, we don’t have any summer rentals available…Try Seward Housing on FaceBook…Good luck!” We try to be as positive and encouraging as we can for all the summer people looking for a place to stay between mid May and mid September. We are in real estate because we enjoy helping people, so it’s difficult when every year we have to dole out the same unhelpful response to the hundreds of people who want to come to Seward to work for the summer. An easy solution does not seem on hand for this annual problem or I am sure by now our resourceful community would have come with something. Every spring since our company started offering property management in 2010, we have had panicked employees and employers calling and trying to find summer rentals. The employers generally aren’t looking for much as far as a standard of living and the employees seem to have the same basic expectations. They would be happy with four walls, a bathroom, and a mattress on the floor, and sadly some of them won’t even be able to find that. Some locals point their finger at the many nightly rentals as part of the problem for the lack of summer rentals available to seasonal employees. However, those properties would likely be filled with year round renters if they were not available as nightly rentals, which would do nothing to help alleviate the demand for places that are available only in the summer months. In fact, most residential rentals in this town are available year round – especially if you add in the income subsidized housing. Of the 80 properties we managed last year, 74% of those were available for year round rentals, 18% of them were seasonal (Sept – May), and 8% of them were summer rentals (May – Sept). So why are so few people leasing out their rental properties on a summer basis? Most owners don’t want to rent out their property to summer only employees because then it is difficult to find renters for the winter when everyone starts leaving town in the fall. It is generally a safer bet for an owner to stick to renting out their place on a long term basis if they want to avoid finding a new set of renters every season. The few summer rentals that are available in Seward generally include utilities and are on the high end of the price range. A two bedroom house for the summer will rent for $2,000-$2,500/month. Even with multiple people living together and sharing the rent, that is more than what most summer workers are able to pay. While some might balk at the price for a summer rental, these rental owners are providing a much needed housing solution for a handful of people, and they fill up quickly. It is also encouraging when we see someone in the community post online and open up a room in their home to summer workers. We happily pass out that person’s contact info with a sense that maybe one less person will either have to decline a seasonal job offer in Seward. Some seasonal business owners over the past years have even decided to purchase well-priced properties to solve their housing issues for the summer. While the housing they make available may not always be the same standard of living that we are accustomed to (some might be dry cabins or tight quarters), it is usually enough to keep their employees happy and returning the next season. 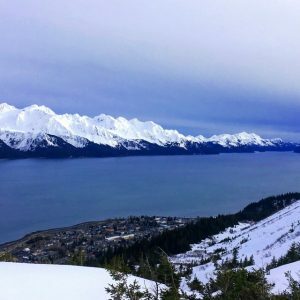 Despite locals making properties and rooms available, or employers providing housing for their workers, there is still a major lack of summer rentals available for hundreds of seasonal employees in Seward every year. So whose responsibility is it to provide housing for this annual influx of seasonal workers who need a place to rest and shower between shifts? We talk about wanting to grow our community and the economic development of Seward, yet we are limited in our ability to achieve our goals because of the lack of accommodations for seasonal workers who are needed to support the businesses and infrastructure of this seaside community. I don’t know what the answer is. For now I have to satisfy myself with the knowledge that my team and I do everything we can to find housing for as many people as possible. In the meantime, if you have a room in a house or an unused cabin out back, please consider renting it out so that there might be one less person stuck sleeping in a tent all summer.